Well, we know it’s a little later than usual this year… With all the craziness that summer brings, sometimes it’s hard to fit everything in! This year we are having our customer appreciation picnic to welcome in the Fall season! It’s that time of year to watch the leaves change and to enjoy some cooler temperatures! Not too cold now!! We would like to show our appreciation to each one of you, our wonderful customers! Without you all, we would not have the best locally based bank on the range! 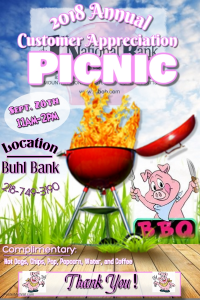 With that said, we will be serving complimentary Hot Dogs, Chips, Popcorn, Pop, Water, & Coffee from 11:00am to 2:00pm on Friday, September 28th at the Buhl branch (702 Seville Ave) to any customers that want to come down! We look forward to seeing you all! Thank you all so much from all of us at FNBOB!